Hot Springs, AR(Saturday, April 14, 2018) – Robert and Lawana Low’s Magnum Moon is now a perfect four for four and holds the top position on the Kentucky Derby leaderboard after scoring an impressive victory in Saturday’s $1 million Arkansas Derby (G1) before a crowd of 64,500. The Todd Pletcher-trainee added 100 points to his 50 from winning Oaklawn’s March 17 Rebel Stakes (G2) to bring his total to 150 points, 16 more than champion Good Magic. The Arkansas Derby was the centerpiece of Oaklawn’s annual Racing Festival of the South, which featured seven stakes races over the final three days of the meeting. Ridden by Luis Saez, Magnum Moon, the 4-5 favorite, grabbed the lead from the break and never looked back, proceeding to set fractions of :23.34 and :48.60 for the first half mile, while being tracked closely by Quip. The winner shied in the stretch, but quickly overcame it to draw off to win by four lengths over Quip, who earned 40 points for second, in 1:49.86 over a fast track. Solomini, the Rebel Stakes runner-up, came from sixth in the nine-horse field to finish third and earned 20 points. He was followed by Combatant, Tenfold, Plainsman, Dream Baby Dream, Beautiful Shot and Machismo. Magnum Moon, a Malibu Moon colt, has now earned $1,177,800. He returned $3.60, $2.80 and $2.40 as the heavy favorite. Magnum Moon returned to his base at Palm Beach Downs in south Florida early Sunday afternoon. 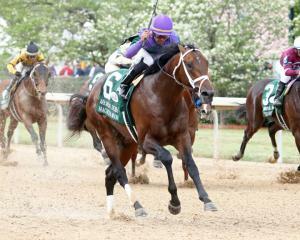 Magnum Moon earned 100 Kentucky Derby-qualifying points Saturday, the final round of points races before the Run for the Roses May 5 at Churchill Downs, and tops the leaderboard with 150. 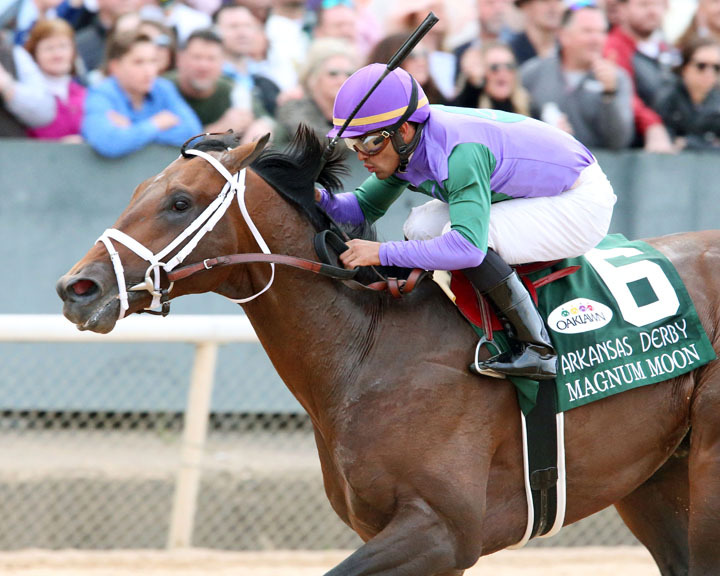 Magnum Moon earned 50 points for his 3 ½-length victory in the $900,000 Rebel Stakes (G2) March 17, Oaklawn’s final major local prep for the Arkansas Derby. Magnum Moon, unraced at 2, will try to become the fourth winner of the Rebel and Arkansas Derby to capture the Kentucky Derby, following Sunny’s Halo (1983), Smarty Jones (2004) and American Pharoah (2015). In addition to Magnum Moon, Pletcher trains three other horses in the top five for the Derby, according to official standings released Saturday night by Churchill Downs. Florida Derby winner Audible is third (110 points), Louisiana Derby winner Noble Indy is fourth (110) and Wood Memorial winner Vino Rosso is fifth (107).